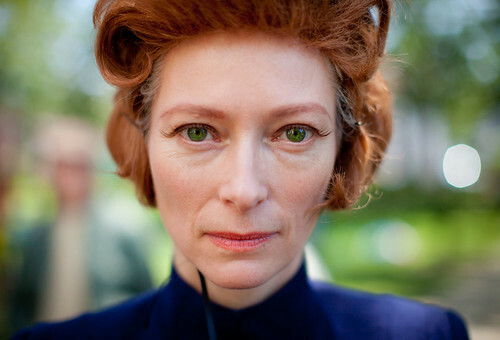 Given MadameNYC’s love of Ms Swinton, I imagine it won’t be long before we see Moonrise Kingdom. Looks amazing. Only Wes Anderson can pull that cast together. For shame! My homemade epic, “Child Killer,” has been removed from YouTube! A copyright owner has claimed it owns some or all of the audio content in your video Child Killer. The audio content identified in your video is Break On Through by The Doors. We regret to inform you that your video has been blocked from playback due to a music rights issue. I didn’t see that one coming, no. Since I first posted it online over two years ago, Child Killer has gotten maybe 100 views on YouTube, half of which I am accountable for – but one of those others was apparently a mole working for Warner Music Group, who successfully ferreted out HanftPort Productions’ flagrant violation of copyright law. The film does feature liberal playtime for “Break on Through” – it plays in at least two scenes, and total playtime amounts to nearly the entire song. I wonder what Warner would ask of our small independent label for the rights? … we have received notification from one or more owners of copyrights claiming that their work has been transmitted over the Internet from your account without their permission… We are concerned that either you or a person with access to your account may be unknowingly participating in certain file sharing or server-related activities that led to this complaint. Included with that letter are copies of emails sent to the ISP on behalf of HBO’s legal team requesting that my account be shut down for downloading the HBO original movie “Recount,” about the 2000 election (a most enjoyable film!) They had the details of the download, including the exact file name and size, and my IP address. Hard to argue with that. Copyright law as it stands today is flawed. We still need laws to prevent people getting ripped off, but as Cory Doctorow of Boing Boing has put it, most musicians’ problem isn’t piracy, it’s anonymity. It’s obscurity. The idea is to get your stuff out there, not keep it away from people. This is the same for most artists in general. Of course it’s not true for large media conglomerates like WMG and Viacom. We talked about this recently in the Junta, and I learned something very interesting. In the traditional business model of the music business, the only ones making money – real money – off records were the record companies. The artists lived off their advances, their ticket sales, their promotional deals, etc. and the only ones making real money off records were maybe the top 100 artists in the business. That business model is rapidly swirling down the drain. So while we won’t have Child Killer on YouTube anymore, we’ll find somewhere else to host it. And while we won’t download HBO original movies anymore, we’ll surely continue sharing media with friends and strangers for a long time. As Doctorow has said, the technology for copying and sharing this stuff isn’t going to get any harder. Those who are smart enough to learn the new rules will prosper in the new era, and those who troll the internet looking for violators will be left in the dust. Dave and I started making movies as soon as my dad allowed us to touch the 8mm family video camera. We were around 10 years old. Naturally, much of what we shot was complete garbage. Not so naturally, my dad was completely frank in telling us this when we showed him our work. This encouraged us to improve production. Child Killer, filmed when we were both about 13 and, I believe, about to begin the eighth grade at George Washington Middle School in Ridgewood, NJ, represents the height of our output. To be sure, the film is incomplete. As were all our films. Usually we would work on a project without a complete script, just filming as we went along, and taking scenes into the editing room as they were finished. Eventually we got bored and started a new movie entirely. We never finished a single film, to my knowledge. Child Killer shows us in our prime, bringing all our technical knowledge to bear. We had saved up money for editing machines which we used to write text, lay over sound, and distort the video with primitive effects like strobe, paint and mosaic. We even added sound effects to amplify the punching, and of course, the gunshot sound was taken from Sniper. When we laid this on our family, everyone, including my dad, was blown away. Everybody jumped at the part when Dave shoots Gia, with its vivid bloodtrail and loud gunshot (thanks, Tom Berenger). And then they all laughed and laughed, because the whole thing is just ridiculous. Major props are due to my dad, for letting us use the camera, for rightly deriding our poor intial efforts, thereby inspiring us to do better, and for digging this video up somewhere last year and burning it to DVD as a Christmas present for me. UPDATE, Jan. 8, 2008: Child Killer has been removed from YouTube for violating copyright. A fine legacy for HanftPort pictures. For more read this.